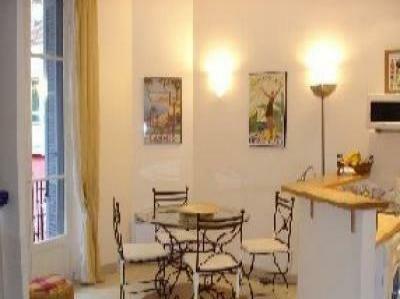 very close to the Rue d'Antibes.with its chic shops and restaurants. (seafront) and beach! Two minutes to the train station and buses. with every convenience for modern and easy living: phone, fax. separate toilet with wash handbasin. Balconies back and front. and supermarket, just a short stroll away. beautiful old buildings, markets and the countryside of Provence! There are five excellent and very scenic golf courses near Cannes. above:   Please contact me for these prices. sheets and towels, and also electricity. busy!! Open to suggestions as regards location for exchange! !